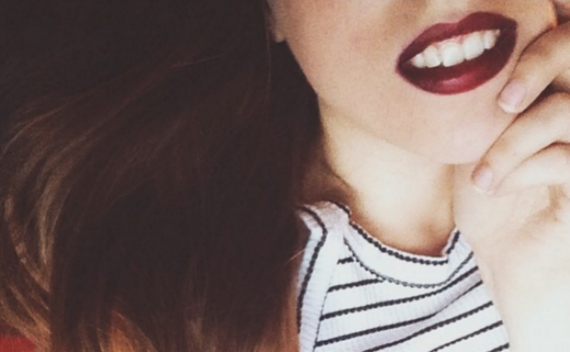 Lipstick and history-obsessed writer and feminist. I can't hide my teeth. They're always there, off-white and glossy, playing peekaboo with the world outside my mouth. My lips are a set of French doors with a flimsy lock, popping open with every passing wispy breeze. I've tried my whole life, but I can't hide my teeth. Don't get me wrong -- I've got nothing against my teeth, per se. Actually, I'm quite fond of them. I even love the bottom ones that survived five years of braces and still turned out crooked and crowded. They are strong, they are healthy, and they are mine. But they are always there. Kids in school would tell me I looked stupid because my mouth was always open. It didn't matter that I was creative or smart or kind; it only mattered that I was tall and shy and I couldn't hide my teeth. I used to clench my jaw and purse my lips in class, but in the end, my teeth always prevailed. My lazy lips were too weak to keep my secrets. I used to cut out pictures in magazines of models with their mouths agape like fish, girls with crooked enamel and gaps that showed with every half smile caught on camera. I used to tape my favorites to my bedroom wall and admire their beautiful imperfections. I thought that someday, maybe I would learn to see my cupid's bow as more than an annoying mirror of my two front teeth, but as a part of me that could be pretty, too. I used to tell myself I could never, ever, ever wear lipstick. From the day my mom first let me start wearing makeup and for a decade after, it was sheer peachy pink glosses for me -- never a fuchsia, rarely a red. 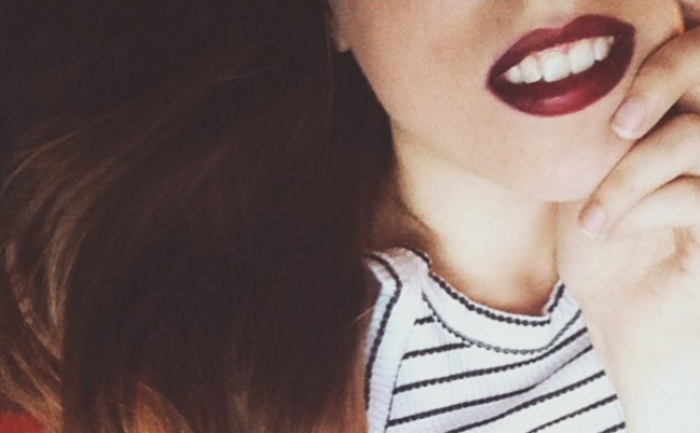 Lipstick, I was convinced, would just draw attention to my toothy affliction. A few times in college, I broke my lipstick rule. I tried to wear bright reds to dances and parties, and it would always end in regret. Despite my affinity for makeup, it was always all wrong -- the wrong shade for my skin tone, the wrong finish, the wrong technique. My insecurity and fear of lipstick was written all over my face, and even more obvious in photos that would haunt me long after my makeup had been washed off. I knew when to admit defeat. I told myself that I was right all along, that lipstick wasn't my thing. I returned to my neutral glosses, focusing instead on lining and blending smoky cat eyes that I knew would draw attention away from my mouth, like I always did. My glasses helped, too, I thought, framing what I believed to be the "right parts" of my face, hiding flaws like the bump on the bridge of my nose and detracting from my impossible lips. I accepted that I'd never be able to wear lipstick for years, until one Halloween when I knew I'd have to bite the bullet and don a true red to pull off my costume. I read article after article on finding the right red for you, blending colors, and achieving the perfect lip line, determined to get through the night without worry. Armed with this new knowledge, I went to the drugstore in search of an inexpensive lipstick to try. I bought two different shades and a lip pencil, and I spent an hour trying to make it work. And in the end, it turned out alright. I felt a little uncomfortable wearing something so bold, but I didn't hate it. I couldn't hide my teeth, but I didn't hate it. For weeks afterwards, I would practice applying lipstick home alone in the mirror, taking pictures and trying to convince myself that I could make it work. Each attempt felt less foreign and more fun than the last. So I decided it was time to experiment. I went back to the store, this time in search of something more interesting, more vampy, more me. I picked up a deep, dark burgundy and turned it over to read the words "Cherry Bomb" on the bottom of the tube. It was perfect. I bought a liner to match and went home to test it out. And when I took a step back from the mirror, my lips parted and painted, I knew there was no going back. I felt pretty. I couldn't hide my teeth, but I felt pretty. Since then I've stocked up on more red lipsticks than I can count. I've learned that I can sport deep blues and purples. I've put on black and felt more like myself than I ever thought possible. I've tried greens and pinks and oranges and each shade has been a fun new challenge. Now, lipstick doesn't scare me. Now, it empowers me. I don't try to hide my teeth anymore. Originally published on Medium. Photo: Brittney M. Helmrich. Follow Brittney (@brittneyplz) on Twitter.